I'm not so sure why people are so hot on front-loading washing machines. You can't soak the laundry, they don't rinse the cloth diapers completely, causing them to stink, the cycle takes ages to run, and they chew holes through just about everything. Like tea towels. 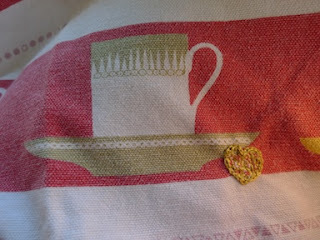 I sort of like these Crate and Barrel tea towels, so I decided to darn the hole created. My best friend's mom taught me how to do this for a Girl Scout sewing badge in the fifth grade, but Martha Stewart also offers instructions here. I wonder what they sew for the badge these days? Ipod cozies? Coffee cup sleeves? I think in our goals of keeping kids "interested," we forget to guide them toward useful life skills. But I digress. 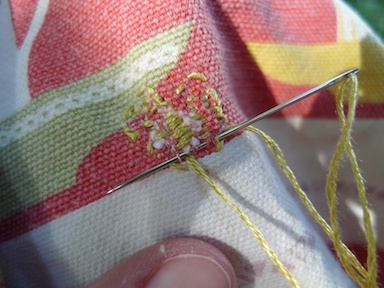 I started by stitching a field around the hole I am fixing, but offering ample space on the edges for the thread to root into. 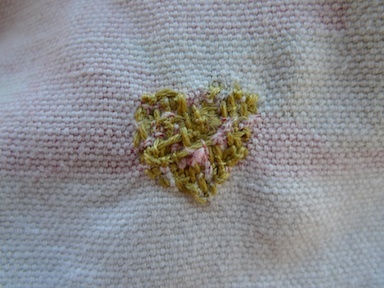 I didn't have any washed-out-red thread, so I decided to create a heart shape in a complimentary color to the print on the towel. So my border area is a heart shape. Usually it would be a square shape. Then I used my needle to create "warp" thread for weaving, to cover the hole. I made as small stitches as possible, but I didn't really sweat it like Martha does, because this isn't a family heirloom, it's a half-worn-out tea towel. Generally warp thread is the vertical, but here I did horizontal first. 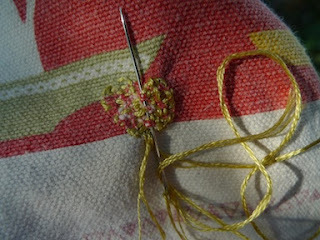 Next, I used the needle to stitch and weave over and under the previous "loom" I'd just created. 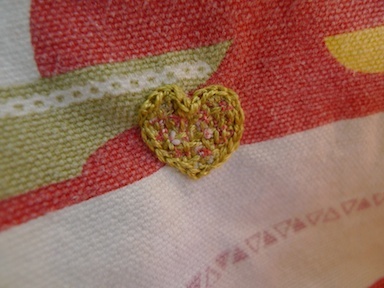 This creates an anchored "fabric" over the hole. If you do a proper job, it looks like real, woven fabric. If you're past 40 and the reading glasses only can do so much, your results may vary. Because I was purposely making this a contrasting design, I decided to embroider a chain stitch around the outside edge at the end. And because a little of the hole still showed through on the back, and I know this thing has to go through my carnivorous washing machine again, I decided to repeat the process on the back, weaving warp and weft so there is a barrier on the back as well. 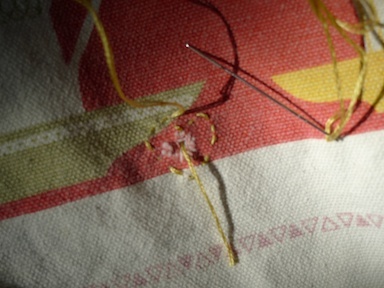 I didn't do a chain stitch around the edge. The final result was super thick, but for a tea towel, I don't really care. 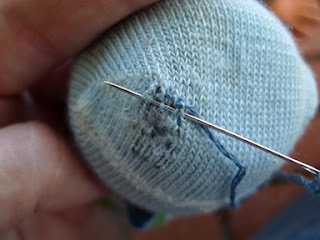 While I was on a roll, I decided to finally mend the hole in Starboy's sock (which barely fits him any more, it's been in the mending pile so long). 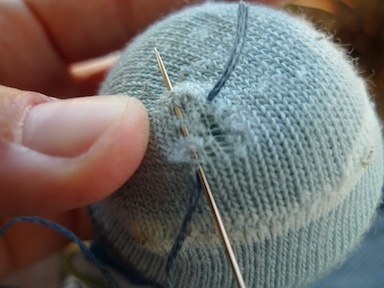 I used an upside-down pinch bowl from the kitchen as a darning egg. First I wove a "warp" thread with the needle. Then I turned the work 90˚ and wove a "weft" thread over and under the warp and the sock threads. I'm not sure what type of thread I was supposed to use for either of these projects. 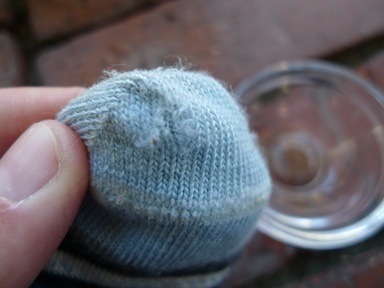 I doubt the shiny cotton embroidery thread was the right pick for the wool socks (Smartwool! Expensive! ), but I wanted to keep it thin so there isn't a big lump at the toe inside the shoe. And besides, that's all I had on hand.